In this video we'll take a look at the benefits of smoking in a dedicated room vs. an open area. We give you tips on how to set up that room the best way possible to contain the smoke and the odors and maximize your results. 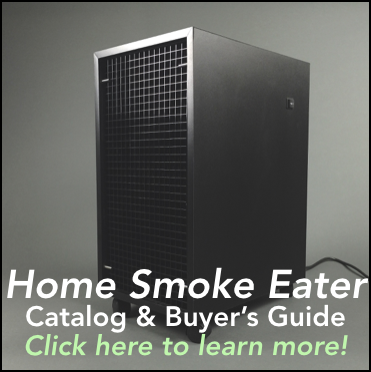 Click here to learn more about the Smoke Stomper home smoke eater. In this video we look at a real world example of how well our machines work. Let's fill the garage with smoke in order to show how well we can clean the air. This is not a very scientific test, but it will certainly give you a good idea of what you can expect from the Smoke Stomper. In this video you can see what it takes to get up and running once you receive your new Smoke Stomper. The set up process is incredibly easy. Just screw in the wheels and plug it in. We'll also cover some tips on where to position your machine here. In this video you can see the three different types of filters that come installed in the Smoke Stomper home smoke eater. A pre-filters, a carbon filter, and a HEPA filter. You change the pre-filters every two months and the other two yearly. A year's supply is included with the machine and it only takes five minutes to change the filters. You might expect the Smoke Stomper to be awfully noisy since it has the same technology that's inside of our commercial equipment, but it was designed to be quiet, yet powerful enough for in home use. It's no louder than a standard room fan and you can hear it for yourself in this video. In this video dan talks about the struggles of smoking in your home, specifically smoking cigars. Please give us a call and we can help you create a solution to fit your specific needs. We always recommend smoking in a single dedicated room if possible. However, if you want to smoke in a more open area of your home, this video has some tips to help you clean the air as efficiently as possible. 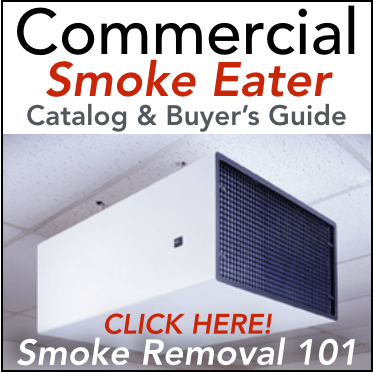 Our smoke eaters are designed to deal with smoke particles and smoke odors, but if you want additional odor removal you can opt for one of our UV units. These will deal with smoke odors as well as odors from pets, cooking, or anything else in your home. It can be a tricky situation if you live in a condo or apartment and have a neighbor that smokes. If you're a non-smoker, smelling smoke in your home is never wanted. In this video we cover how to deal with a neighbor's smoke odors. If you smoke in your office at work, our Smoke Stomper home smoke eater is a great option for you. Give us a call now for immediate assistance with your specific smoke problem!